When you apply for Social Security Disability Insurance (SSDI) or Supplemental Security Income (SSI) benefits, Social Security considers all the medical records and other evidence in your case before it makes any decisions on your eligibility for benefits or your benefit amount. When Social Security makes a decision on your claim, it will send you a letter explaining its decision. If you do not agree with its decision, you can appeal – that is, ask SSA to look at your case again. When you ask for an appeal, Social Security will look at the entire decision, even those parts that were in your favor. If it determines that its initial decision was wrong, Social Security will change it. If you wish to appeal, you must make your request in writing within 60 days from the date on your denial letter. [Note: Social Security gives you an additional five days “grace period” to appeal, as it assumes you received the letter five days after the date on the letter, unless you can show us you received it later.] 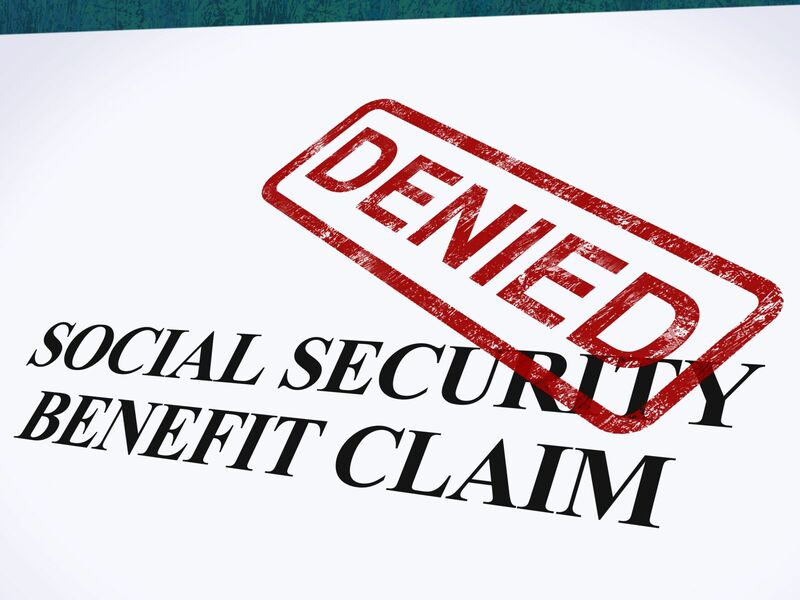 If you filed for Social Security disability benefits or SSI and your claim was denied for medical reasons, you have the right to hire an attorney to assist you in filing your appeal. When Social Security sends you a letter about a decision on your claim, it will tell you how to appeal the decision. A reconsideration is a complete review of your claim by someone who did not take part in the first decision. The Social Security claims handler will look at all the evidence submitted when the original decision was made, plus any new evidence you provide. Most reconsiderations involve a review of your files without the need for you to be present and testify. But when you appeal a “cessation” decision that you are no longer eligible for disability benefits because your medical condition has supposedly improved, you can request a hearing or meeting with a Social Security representative to explain in person why you believe you still have a disability or continue to be disabled. If you are not sure this is the form you should use, call an experienced Social Security Attorney for advice, or call 1-800-772-1213 (TTY 1-800-325-0778) or your local Social Security office and they will help you to complete the right appeal form. SSA-3441, Disability Report – Appeal, and SSA-827, Authorization to Disclose Information to SSA. You may also need to complete a form SSA-1696, Appointment of Representative, if you are appointing an attorney to represent you as your representative. Your representative will also sign the SSA-1696 before you send it to us. Time to Submit New Evidence: You should submit any new evidence you want the ALJ to consider with the request for hearing or within 10 days after filing the request. You should make sure that all evidence is received by the ALJ or is available at the time and place set for the hearing. However, if your claim is filed in Maine, New Hamshire, Vermont, Massachusettes, Rhode Island, or Connecticut, you must submit any evidence you wish to be considered at the hearing no later than 5 business days before the scheduled hearing. Failure to comply with this requirement may result in the ALJ declining to consider the evidence. The hearing will be conducted by an Administrative Law Judge (ALJ) who had no part in the original decision or the reconsideration of your case. The hearing is typically held within 75 miles of your home. The ALJ will notify you of the time and place of the hearing. Before the hearing, Social Security may ask you to submit more evidence or to clarify information about your claim. You may review all the information in your claim file and submit new information, including witness statements, statements from your doctors and updated medical records. At the hearing, the ALJ will question you and any witnesses you bring. Other witnesses, such as medical experts or vocational experts (job experts), may also be asked to testify at the hearing. You and your attorney will have an opportunity to question any of the witnesses. In certain situations, Social Security may hold your hearing by a video conference rather than in person. In these instances, Social Security will let you know ahead of time if the hearing will be by video. With video hearings, Social Security will try to make the hearing location convenient for you; in most cases, a video hearing location will be closer to your home than an in-person hearing location. That might make it easier for you to travel to the hearing location, and have witnesses or other people accompany you. An appearance by video can usually be scheduled faster than an in-person hearing. If you are unable to attend a hearing or do not wish to do so, you must tell Social Security why in writing as soon as you can. It is usually to your advantage to attend the hearing (whether in person or by video conference). You and your attorney (if you have one) should appear at the hearing and explain your case. Unless the ALJ believes your presence is necessary to decide your case and requires you to attend, you may not have to go. Or, Social Security may be able to make other arrangements for you, such as changing the time or location of your hearing. You must have a good reason for Social Security to make other arrangements. After the hearing, the judge will make a decision based on all the information in your case, including any new information you submit. Social Security will send you a letter and a copy of the judge’s decision. If you disagree with the ALJ’s hearing decision, you may ask for a review by Social Security’s Appeals Council. Your attorney or Social Security will help you ask for this review. The Appeals Council looks at all requests for review, but it will deny a request for review if it believes the hearing decision was correct. If the Appeals Council decides to review your case, it will either decide your case itself or return it to an ALJ for further review. If the Appeals Council denies your request for review, Social Security will send you a letter explaining the denial. If the Appeals Council reviews your case and makes a decision itself, Social Security will send you a copy of the decision. If the Appeals Council returns your case to an ALJ, Social Security will send you a letter and a copy of the order. If you disagree with the Appeals Council’s decision or if the Appeals Council decides not to review your case, you may file a lawsuit in a federal district court. The letter Social Security sends you about the Appeals Council’s action also will tell you how to ask a court to look at your case. In Cessation Cases, Will Your Benefits Continue? You are appealing Social Security’s decision that you are no longer eligible for SSI payments or that your SSI payment should be reduced or suspended. If you want your benefits to continue, you must tell Social Security within 10 days of the date on Social Security’s cessation or cut-off letter. If your appeal is turned down, you may have to pay back any money you were not eligible to receive. Can Someone Help You With Your Appeal? Yes. You have the right to have a lawyer help you. Someone you appoint to help you is called your “representative.” Social Security will work with your representative just as it would work with you. Your representative can act for you in most Social Security matters and will receive a copy of any decisions it makes about your claim. Mr. Ortiz is a Board Certified Social Security Attorney. Mr. Ortiz handles appeals when you have been denied Social Security Disability Insurance Benefits or Supplemental Security Income Benefits. Federal District Court cases where the Appeals Council denies review. If you want more information about having a Board Certified Social Security Attorney represent you or help with your Social Security disability appeal, contact us today at (850) 308-7833 for a free case evaluation.